Whether you've gone through it once, or multiple times, those first few weeks after having a baby can be a big struggle. A new mother may feel isolated from everyone (even her partner), because only she knows what she's going through. We all have busy lives, probably raising a brood of our own, but if you know a mom who has just given birth, spare her a thought. It doesn't end with just congratulating her or sending balloons. As you may have experienced yourself, it's only when you bring home the baby that things get very real. The new responsibility falls on your exhausted shoulders with a big thud. Your body, which feels like it was hit by a boulder, is not quite sure it can bear the weight. Your mind seems to be coming to pieces. 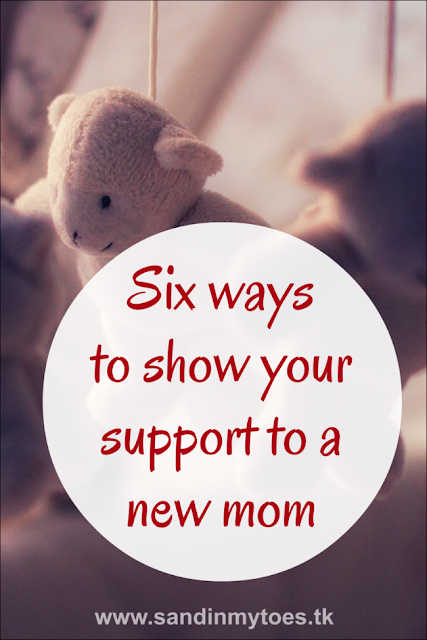 This is precisely why we must give the new mom we know more than a congratulatory call. We need to reach out to her and give her an emotional hug. We may not be able to relieve her of her sleep deprivation, or the feeling of helplessness against a seemingly monumental task. But we can help her feel a little better, and that counts for a lot. When all you do day in and day out is feed the baby and change diapers, you crave adult conversation so badly. Whenever you have a few minutes, give her a call and let her talk. You don't even have to talk about baby stuff, the idea is to just get her talking and speaking her thoughts out loud. Even if it is for half an hour, offer to take her out for coffee or invite her to your home. If she has no one to look after her baby, just go visit her yourself. A change of place or even new faces can be so relieving for someone who's been mostly stuck at home. Home cooked food would be wonderful, but if you can't, at least have some food delivered to her. Not having to worry about one more meal would be such a big help to her. Her family will totally love you for it! 4. Offer to help with the kids. If she has other kids, offer to take care of them for a little while so she can get some quiet sleep. If she doesn't have other kids, just offer to hold the newborn for a while. An hour's extra sleep can be a real blessing. 5. Be there for her. Even if you can't do much, just let her know you're there for her. It would mean a lot to her to have someone she can talk to. It doesn't make the struggle any less, but it would put her in a better state of mind. You may have a lot of your experiences to share, but take care to focus on the positives. A new mom can be very vulnerable about her baby's feeding and sleeping, and about her own body. So, pep her up with encouraging talk, rather than anything that will only create more worry. Also refrain from too much advice. Every baby is different, and what worked for you may not work for her. You may not be able to offer all of this, but do whatever little you can to make that mom feel better. It wouldn't just make you a good friend, but a wonderful member of the community.